The Substance Misuse Program (SMP) provides an integrative, inclusive, personalized, and collaborative approach to talking about and addressing substance use and other related issues. To learn more about this program, its underlying philosophy, information on substances, and the various resources available to you, please see the pages below or visit our website. We adopt and practice from a harm reduction philosophy, as we critically believe in meeting students “where they are” in relation to their needs and goals. As such, our clinicians consider the full continuum of substance use, the multitude of possible concerns and objectives, and the myriad of ways of working uniquely towards positive change, where any goal aimed at reducing harm is valid. One of the pioneers of this stance, Dr. Alan Marlatt, describes this orientation as “compassionate pragmatism” (1998), noting that it is grounded in the principles of deep respect, compassion, and empowerment of each individual. 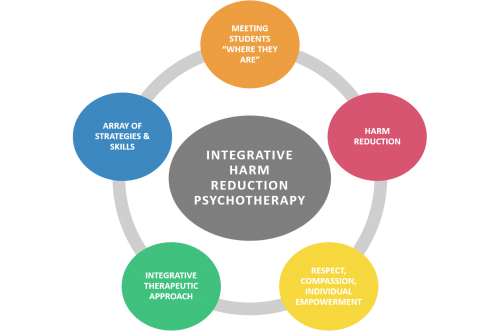 The above philosophy and principles are embodied in Integrative Harm Reduction Psychotherapy (IHRP; 2007), as developed by Dr. Andrew Tatarsky. According to IHRP, MSMP recognizes the complexity of substance use issues for each individual and thus aims to tailor treatment to fit the individual. We draw on multiple therapeutic traditions, including psychodynamic, humanistic, and cognitive-behavioral, and we utilize an array of methods, including mindfulness strategies, and discovering the layers of meanings and functions of these behaviors – all in an effort to engage the whole person.